There’s been an energy that’s been somewhat lacking at Sundance 2018 so far. The buzz among critics is that there’s no “The Big Sick” or "A Ghost Story" or “Call Me By Your Name” this year, and people feel like they’re anxiously waiting for that film to explode into the public consciousness like great ones have from this platform in the past. You could literally sense that anticipation in the room before Boots Riley’s “Sorry to Bother You” premiered on Saturday night. People were laughing and chatting and buzzing. The promise of something unexpectedly groundbreaking, starring two of the best young performers alive, hummed in the air. And then the film unfolded...and it's not exactly like anything that anyone there had ever seen before. It is a hilarious, moving, crazy, ambitious piece of satire, a film that’s inspired by visual artists like Michel Gondry and the visual language of music videos with a mind-blowingly daring sense of satire that recalls the extreme nature of someone like Jonathan Swift. It’s definitely a cultural commentary on the working class, especially the minorities within it, but it’s also about a dozen or so other things at the same time. It is a loud, passionate pronouncement of a major talent in writer/director Boots Riley (from the great The Coup), and it’s something you need to see to believe exists. 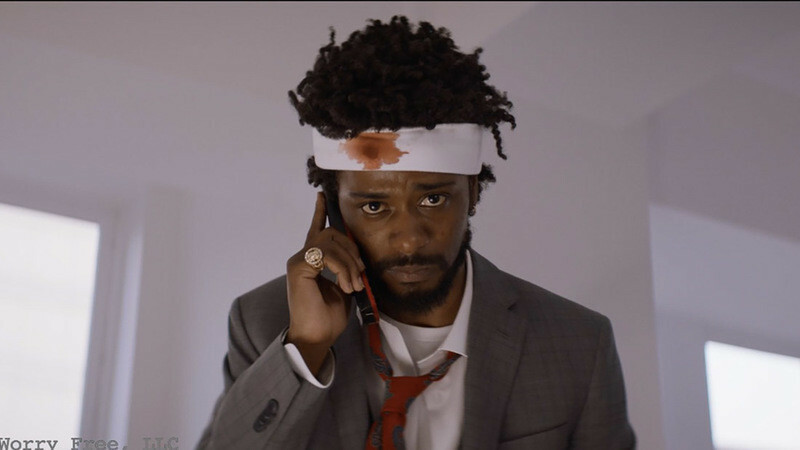 The increasingly phenomenal Lakeith Stanfield gives his best performance to date as Cassius Green, a 30-something Oakland resident who lives in his uncle’s (Terry Crews) garage. Cassius is like so many men in this world, just trying to make ends meet and getting tired of that numbing pursuit defining his life. He openly wonders to his artist girlfriend Detroit (Tessa Thompson) if any of it really matters. Who will remember him when he's gone? What impact could he make? And it certainly doesn’t seem like his societal relevance will be on the upswing when he gets a horrendous telemarketer job at a company called RegalView. But things change for Cassius when he learns how to master the use of his “white voice” when making calls, allowing him to move up the ranks in his company to the “power callers” who work upstairs, selling, well, things people really shouldn’t be selling. The story of a young man who sells his soul for financial stability would be enough to propel most movies but it’s literally just the skeleton here on which Riley hangs so much other cultural commentary that it’s nearly blinding. Detroit is a part of a Banksy-esque collective called Left Eye, a group that is vandalizing corporate billboards every night, and her increasing rebellion offers a counterpart to Cassius’ deconstruction of who he really is. It’s almost as if as he tamps down more of his personality, she feels an obligation to express more of hers. At the same time, there’s a union movement underway at RegalView (led by Steven Yeun, finding a different, more adult register than he has before, and including the always-welcome Danny Glover), and Cassius catches the eye of the coke-snorting, gun-waving, sarong-wearing, maniacal Steve Lift (Armie Hammer), the CEO of a company called WorryFree. What do they do? They encourage you to give up on things like worrying about rent or car payments, and just live where you work in bunks where you get what looks like prison food. In other words, they advertise and sell to corporations slave labor. “Sorry to Bother You” is a visual feast as Riley balances the relatable human story at the center with unforgettable, daring imagery. It could be something as simple as the way he portrays Cassius and Detroit’s financial rise (their garage room literally deconstructs and reforming into a fancier one) or the almost Terry Gilliam-esque approach to a world not exactly ours but not far off that defines the entire film. Like Gilliam or Gondry, Riley is constantly drawing attention to his choices through their extremity. For example, rather than have Stanfield attempt the job-changing “white voice,” he literally dubs him, and others, with pretty famous actors that most people will recognize instantly, amplifying the disconnect and ridiculousness of it all. Like a lot of great satire, Riley turns most of his choices up to 11. You go all in, or you don’t go at all. And it’s that riskiness that feels so refreshing and ambitious. But a movie doesn’t work, even a satire, if we don’t have anything human to hold onto, and so Riley’s smartest decision was to use the blinding likability of Stanfield and Thompson to ground the film’s more out-there elements. Stanfield always feels like he’s playing the truth of the moment, even when it’s broad satire, and Thompson is as likable as she’s ever been. The film also deserves notable praise for its tech elements, including a soundtrack by Riley and the Tune-Yards, vibrant production design, and some of the best costumes I’ve seen at Sundance—Detroit’s artistic sensibilities inform her fashion, especially her unforgettable homemade earrings in such a memorable way that they could actually spark a line of film-related products.